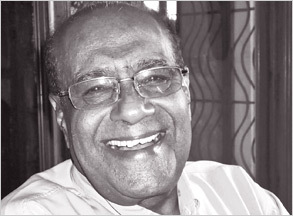 Namel Weeramuni, dramatist and actor, is an extremely engaging and effervescent man. Lively and bubbly, he immediately puts anyone at ease. Namel Weeramuni whose craft and forte is drama is no newcomer to the limelight. Reminiscences of Gold met with him at his Punchi Theatre. “I was born in Ahungalle. My parents were not that rich but they were fairly alright. My father was running a wholesale Cinnamon business in Balapitiya. My mother was a housewife. Unfortunately my parents died when I was small. My father died when I was about six and my mother died when I was 14-years-old. And I became a totally self- made man from that time onwards. There were two uncles of mine who helped me in my education. One was working in the government service at that time. The other one was a priest. He was my mother’s brother. I have a sister and she is still living in the village,” said Namel. Namel studied at the University of Peradeniya where he got his degree in Sociology. He remembers his university days as the most memorable period in his life. “Ambassador Jayantha Dhanapala, Professor J. B. Dissanayake, and Minister Sarath Amunugama were some of my contemporaries. There was ragging in the university but through ragging we also made long lasting friendships. But at that time ragging was decent and not violent. I remember the way I was ragged in my first year. K.H.J. Wijedasa who later became Secretary to President Premadasa. gave me half a cent and said: ‘Go and get a packet of Cigarettes and don’t forget to bring the balance.’ At that time the smallest coin was half a cent. So I did not know how to bring the balance. After his marriage to Malini in 1963, he joined the Law College and became a lawyer. When he was working as an Assistant Legal Draftsman, he got a scholarship to go to Canada for three months. When he came to Washington from Toronto after completing his work, he got an assignment to observe the proceedings at the US House of Representatives and the Senate. He thought that this experience would be helpful for him in his career as a Legal Draftsman and applied for an extension of his leave for a further period of three months. It seems that his letter has got lost on the way. When he came to London on his way back to Colombo, he was shocked to hear from Malini that he has been served with a vacation of post letter. Namel and his wife Malini have been associated with dramas for a very long time. One of their dreams came true with the building of ‘Punchi Theatre’ which is being used now for many literary activities. “Since 1962 when we were rehearsing under the trees at the Royal Primary, I was wondering why we couldn’t have a proper place for rehearsals. That was how the idea got into my mind. Subsequently in London we started collecting funds. I was working in a petrol station. During Christmas there were a lot of lavish tips and I got 63 Pounds as my share. When it was given to Malini, she went inside and brought an empty biscuit tin and put all the money there and said: ‘this is for your little theatre’. And that was the beginning of the collection of funds. Later I had a very lucrative legal practice. A certain amount of our earnings were set aside in a special account. Of course we had a huge house in Campbell Place on a 50- perch land. We had sufficient funds from our savings to build one floor. Malini suggested to sell the house. It was with the money we got from the sale of that property that we built the Punchi Theatre,” recollected Namel. Usually this kind of ventures are undertaken by foundations or institutions. It is not very often in this country that one finds individuals who sacrifice their personal wealth to promote a common cause. The Weeramunis are an institution unto themselves. The Punchi Theatre stands as a magnificent monument to their personal dedication and commitment to the promotion of arts and culture in this country.